If you are sourcing for unique gift merchandise from the Philippines, you need not look further. You have come to the right place! 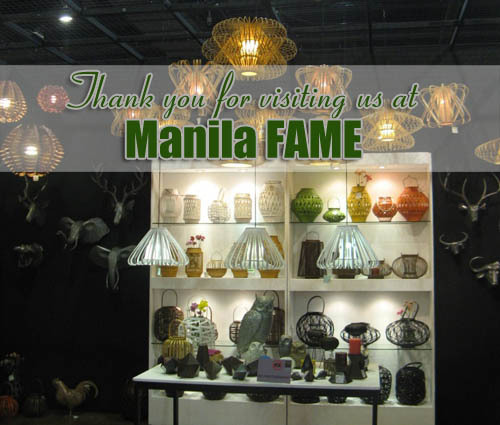 We have been exporting Philippine handicrafts for more than 40 years and carry a wide product range for your selection. Our products include Bamboo Lanterns, Hanging Lampshade Pendants, candle holder, sinamay baskets, gift packaging, photo frames, novelties, planters, votive holders, capiz lanterns, shell crafts and many more. Please browse our on-line catalog to view our products. Our extensive network of subcontractors all over the Philippines and our team of in-house designers guarantee up-to-date gift items every season. In addition, we can work with buyer’s own designs. We have exported our products to the United States, England, France, Germany, Japan, Australia, Sweden, Portugal, etc. We hope to include you as part of our growing list of satisfied clients.